I'm a photographer based in the north of the UK working on long term landscape photography projects. I have been published and exhibited both in the UK and abroad and am co-founder of the Inside the Outside photography collective. Landscape photography is the perfect vehicle for narrative and storytelling. 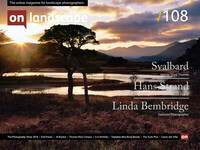 I'm interested in the history of landscape and human interaction and alteration of landscape. The long departed people who have shaped that world sing songs. I'm slowly learning to listen. I was secretly pleased to be asked to write about my favourite photograph. It's not often you get the mic passed directly to you and I hope you’ll take a few moments to look up from the sparkly over-saturated buffet of landscape photography. I often wonder how many landscape photographers look at non-landscape photographs. We seem to be an insular bunch (apart from me, of course). I think landscape photography is a valid and impossibly important vehicle for storytelling, as much as any other form of photography, documentary or conceptual. It just isn't utilised as often as it could be in this way and at times still has a whiff of old fart in a camera club about it. Do we really need to see another photograph of a sunset etc etc? I found looking at documentary photography in particular informed my own ideas about the landscape much more completely than most landscape photography has to date. There are of course many many exceptions but they’re up to you to find. I thought it would be difficult picking one photograph. It turns out it wasn't. There’s one particular image I want to share with you more than any other. I first saw the work of Finnish photographer Sirkka-Liisa Konttinen on a documentary I'd stumbled across one hazy and red-eyed evening. It was about revisiting a community in the North East that she had first photographed in the early 80’s. Although the original project is a thing of utter wonderment, I found myself more strongly drawn to the revisit. I tend to have a propensity for over-thinking the period of time between making a photograph and returning to the original subject.I loved the idea of an older version of her re-photographing a completely changed community, like seeing a past lover after twenty years and immediately noticing the grey hairs and wrinkles while the essence of why you loved them radiates through the advance of time and ageing. The photographs in the more recent series are as gentle and loving as the first. She seems to me to give part of herself away when photographing people. It isn't enough to just document - you have to give up something in return. I firmly believe this to be the case for landscape photography. You borrow the land, leaving an almost intangible something behind and suddenly the work you are producing becomes more. It starts to transcend the original concept. The photograph I've chosen instantly resonated. This was pre-fatherhood for me so the romantic notions and connotations weren’t as apparent as they would have been had I seen this now. The details were always the most fascinating aspect. Obviously the bubble into which the scene would have been reflected and distorted is literally and figuratively central but the clock on the wall, the baby monitor, dartboard and ubiquitous ceiling light (these always remind me of William Eggleston) ground the photograph in the everyday while the family, distracted, enjoy each other without seemingly being aware of the photographer. She has the ability to be invisible while at the same time she gently influences the scene, making one of the most glorious photographs I've ever seen. The bubble for me at least represents the fragility of the moment. Like the bubble, it will inevitably burst. It speaks of our tenuous grip on life. All too easily split apart. To the outside of the bubble the lives of those pictured spill. For such an innocent and domestic scene it harbours both a melancholy and an unbridled hopefulness. As a photographer seemingly parachuted into this community I can't imagine what the original residents must have thought of her. The bubble for me at least represents the fragility of the moment. Like the bubble, it will inevitably burst. It speaks of our tenuous grip on life. All too easily split apart. A young woman from Finland suddenly appearing in their tight-knit community intent on documenting their lives. Can you put yourself in her position for one moment and imagine how brave she is to have done this? An unbridled curiosity and love of people led her there. You can feel this tenderness in each photograph she makes. There’s no sneering or brutal detachment but a warmth and concern for her subjects. As with all photography I believe the sensations and thoughts behind one genre can be learnt from and applied to another. To absorb all aspects of the photographic world and apply it to the thought processes behind your own work can only expand the meaning of the photographs you have made, are making, are about to make. I believe Sirkka-Liisa Konttinen thinks before she presses the shutter. I hope you do too. With so many photographers selling the dream with workshops it’s easy to get lost amid the uproar should you express a contrary opinion. I would say ignore the white noise and look at the work of this extraordinary talented woman. I can't ever imagine her arguing about cameras, film vs digital or any of the other tedious arguments that seem to crop up from time to time. Some photographs make me want to understand the photographer who made it. And there's nothing more human than wanting to be understood. That moment of connection when you look at a photograph and you feel like you've been taken by the hand and led somewhere you would never have gone, by someone you're probably never going to meet. You have a camera. You have a story, so go tell it. P.S. Every time you use HDR a kitten dies.